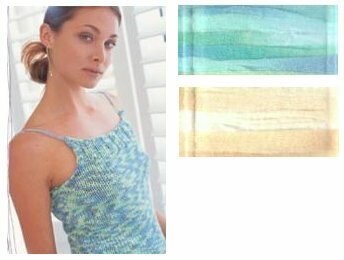 I'm in the process of cleaning out my yarn stash and have decided to unload six skeins of Phildar Copacabana that I bought for the tank pattern below. My bust is bigger these days and I just don't think the tank would suit me. I have three skeins in Atoll (shades of blue) and three in Naturel (beige-off-white shades---you can read more about both here). They retail for about $6.30 in Europe; I'm offering three skeins for $18 or all six for $32 (+ shipping), plus the pattern thrown in for free (I think the three skeins make up to a size 38-40 bust). If I don't hear from anyone within a couple of days I'm going to put them on Ebay. E-mail me at whoiamATstinkerpieDOTnet or leave a comment if you're interested! Oooo! I'm interested in the blues, if it's still available! It's yours, Shannon! Any takers for the Naturel? It's a nice, goes-with-anything kind of color. I'll take the Naturel, if still available.